While speaking with Sabrina recently, we both recognized a common rhetorical technique increasingly employed by corporate education reform leaders and their political defenders. As increased pressure and critical examination is delivered to said leaders, they have used the “silent majority vs. vocal minority” technique. This approach attempts to pit an abstract “silent majority” of supportive parents, teachers, students, and community members against a “vocal minority” of antagonistic critics who corporate reform leaders castigate as zealous, extremists filled with dogmatic negativity. Meanwhile, the hypothetical “silent majority” never gets produced in mass so this body of largely fictional supporters and ardent allies remains conveniently undefined. It’s true that occasionally a lone rank-and-file teacher or parent comes forward and encourages the corporate reform package as a whole. Once, grassroots citizens in a school district have observed and directly experienced the consequences of the corporate reform agenda it typically becomes difficult to find unequivocal groups of supporters outside of neoliberal, pro-business, unfettered free-market ideologues. Mostly though, this massive group of ardent allies who are poised and ready to champion the corporate reform agenda remain imaginative and fabricated. This technique is not normally used immediately when stakeholders such as teachers, parents, students, and community members first identify, question, and criticize corporate-driven school reforms. It usually gets dragged out of the rhetorical closet later in a more vulnerable, even desperate stage in the process. There comes a point when enough people are publicly questioning and taking meaningful actions against corporate education policies, programs and often the overall agenda. This tipping point creates a crisis for said corporate reform education leader(s), who can no longer outright ignore teacher, parent, student and community concerns. However, rather than risk affirming the legitimacy of those troublesome critics and their arguments by engaging directly on the issues in any substantive, in-depth manner, the corporate reform education leader(s) will instead dismiss and deny meaningful points that get raised using quick personal retorts and distortion. By then in the process, desperation had set in and Brizard was reacting defensively. In our situation in Rochester, it certainly seemed that the vocal minority became a vocal majority as time and effective organizing went on. Early on I knew I recognized this defensive technique historically speaking. Being a social studies teacher and avid reader of critical history, I scanned my memory and quickly came to Richard Nixon’s “The Great Silent Majority” speech. The speech, delivered on November 3, 1969, was Nixon’s reaction to criticism and protest of the Vietnam War and has been misappropriated many times since then to marginalize dissent. I would be very concerned if the mayor had chosen a superintendent who didn’t have any controversy, because when you’re doing the tough things, making the hard decisions, there’s gonna be some controversy. If you have everybody loving you that means you’re probably not making the tough decisions. While speaking with Sabrina, I related this technique to Education Secretary Arne Duncan’s Open Letter to America’s Teachers and Sabrina’s analysis and response to Duncan’s insincere deception. I stand in solidarity with Sabrina and all the other teachers and organizers, as we blasted the hypocrisy of Duncan’s letter as well as their resulting refusal to come to terms with reality. When USDOE Press Secretary Justin Hamilton stated “We don’t think that’s how the broader teaching community feels about it” in response to the strong levels of criticism, this made me turn back to the “silent majority and vocal minority” technique. Whether it’s Rhee, Duncan, Brizard, Hamilton or anyone else on the corporate deform gravy train, we have got to continue to increase the pressure as we struggle and organize for meaningful reform and positive changes in our schools. Interesting that Nixon was most known for this defense. For all of our sakes, I hope they’re not as criminal as he was! While I think Nixon may have gotten a slightly bad rap compared to what administrations since then have pulled off (Are you kidding, Watergate today would be Page 11 news), I agree with everything Marc said. And I renew our call to pressure the MSM to put one of our reps on their networks whenever the subject of education comes up. Too many of the “experts” have never taught in the classroom (Bill Bennett) or have lied about their “successes” in the classroom (Michelle Rhee). And I agree, we need media watch dogs, not lap dogs. We’re in serious times, we need serious coverage so we can make good choices. “Mostly though, this massive group of ardent allies who are poised and ready to champion the corporate reform agenda remain imaginative and fabricated.” And exaggerated. This interview is so contrived. A vote of no confidence is pretty extreme and he acts as if it was just a few bad eggs who caused him some problems. He comes across as so sincere, regretful, sad, disappointed. Hey–he is not alone. The community feels the same way–only they regret his superintendency. They are disappointed in his lack of leadership. They are sad that they wasted so much time, energy, and vocalization on getting rid of JCB. They are sincerely glad to see him gone. Isn’t this guy a Broadie? It’s disturbing that this level of thespian and sophist rhetoric is accepted as genuine by some out there. Using a critical analysis of the central issues in play, we can avoid getting lost in the sauce with this deceptive foolishness. Hmm. Let’s see how it goes for Brizard in Chicago. Keep us posted, Chicago teachers. What’s the latest word on fellow Broadie, Goodloe-Johnson, formerly of Seattle? Great analysis, Mark. We’re seeing exactly this response in Charlotte, N.C., where parents are rising up against a massive expansion of standardized testing. Thanks for connecting us to the broader picture! Thanks for the reminder. I just taught propaganda techniques to my kids a little over a week ago, and am reminded of how it was used/is being used to drive RHEEform in LAUSD. Stakeholder groups are generally mentioned when it is convenient to thwart anyone who questions what administration is up to. A few pet parents constitute the community. A few nervous kids become the face of the campus–and suddenly there is the silent majority. Parent and teacher activists may be a vocal minority but we are much more aligned with the silent majority of public opinion than the very tiny oligarchy w/ huge wealth that is dominating ed policy in this nation. For example, despite all the speeches by Gates and Duncan and all the bogus reports they commission, class size reduction remains a top priority of most parents and voters of both parties. 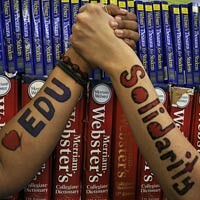 GothamSchools » Remainders: How serious is this year’s teacher layoff threat? Online Education in America » Blog Archive » Remainders: How serious is this year’s teacher layoff threat?